In contrast to its carbon counterpart, two-dimensional borophene cannot be reduced from a larger natural form. Bulk boron is typically present only in combination with other elements and is indeed not layered, hence borophene must be derived from the atoms up. Still, the borophene that is obtained may not be exactly what that is required. Thus, scientists at Rice and Northwestern universities have created a technique to see 2D borophene crystals, which can have several lattice configurations—known as polymorphs—that in turn decide their characteristics. Gaining insights into how specific polymorphs can be obtained could help manufacturers include borophene with required thermal, electronic, optical, and other physical properties into products. Boris Yakobson, a materials physicist at Rice’s Brown School of Engineering, and Mark Hersam, materials scientist at Northwestern, guided a team that discovered how to view the nanoscale structures of borophene lattices as well as developed theoretical models that helped characterize the crystalline structures. Their outcomes have been reported in Nature Communications. It is difficult to produce borophene even in small quantities. Even if it can be scaled up, manufacturers will probably prefer to modify it for applications. The insights gained by the Rice and Northwestern teams will help in that regard. A single form is taken by graphene—a series of hexagons, resembling chicken wire—but an ideal borophene is a grid of triangles. Nevertheless, borophene is a polymorph, a material that can take many crystalline forms. The electrical and physical properties of borophene are determined by its vacancies that leave patterns of “hollow hexagons” in the lattice. Yakobson reported that there could be theoretically over 1000 types of borophene, each with distinctive characteristics. It has many possible patterns and networks of atoms being connected in the lattice. The work commenced at Hersam’s Northwestern lab, where scientists customized the blunt tip of an atomic force microscope with a sharp tip of oxygen and carbon atoms. That offered them the potential to scan a flake of borophene to detect electrons that signify covalent bonds between boron atoms. They employed a scanning tunneling microscope that was customized in the same way to identify hollow hexagons where a boron atom had been lost. By scanning flakes developed on silver substrates under different temperatures through molecular-beam epitaxy, a variety of crystal structures were revealed, as the varying growth conditions modified the lattice. The team under Yakobson employed first-principle simulations to find out why borophene took on specific structures on the basis of the calculation of the interacting energies of boron as well as substrate atoms. Their models were corresponding with many of the borophene images created at Northwestern. The scientists proved through their analysis that borophene is also not an epitaxial film. Put simply, the arrangement or rotational angle of borophene is not influenced by the atomic arrangement of the substrate. 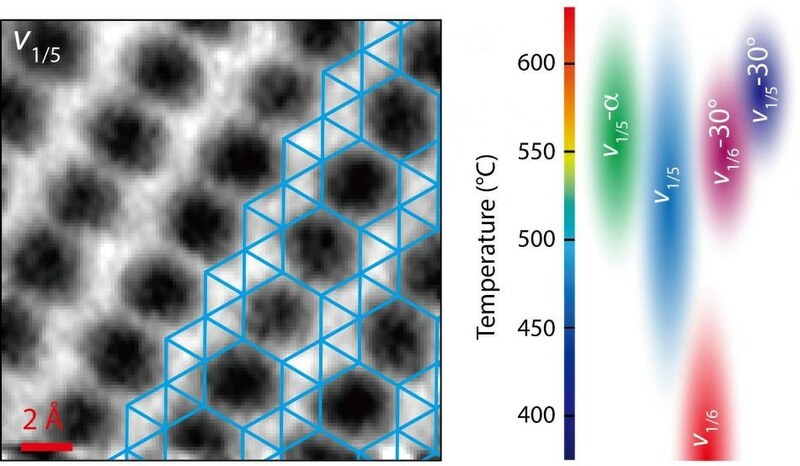 The group created a phase diagram that outlines how borophene is likely to produce under certain temperatures and on a range of substrates and noted that their microscopy developments will be useful for determining the atomic structures of promising 2D materials. The development of methods to characterize and control the atomic structure of borophene is an important step toward realizing the many proposed applications of this material, which range from flexible electronics to emerging topics in quantum information sciences. The lead authors of the paper are Xiaolong Liu of Northwestern and Luqing Wang of Rice. Shaowei Li and Matthew Rahn of Northwestern are co-authors. Yakobson is the Karl F. Hasselmann Professor of Materials Science and NanoEngineering and a professor of chemistry at Rice. Hersam is the Walter P. Murphy Professor of Materials Science and Engineering at Northwestern. The study was supported by the Office of Naval Research, the National Science Foundation, the Department of Energy Office of Science, and the Northwestern University International Institute for Nanotechnology.